2 grinding wheels grind coffee beans without overheating and preserve coffee aroma. The device offers an ability to choose between several types of grinding. The whole construction is made of plastic, so it might be rather fragile. This professional device ensures a consistent grind texture quickly, efficiently and safely. 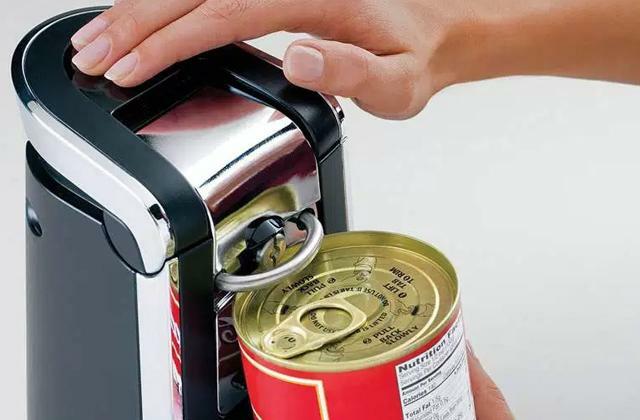 The coffee grinder can be stored easily owing to the convenient cord storage compartment. Boasting a capacious airtight bean hopper and an ergonomic coffee cup selector (2-12 cups), the unit will help you to grind as much coffee as you need while keeping the beans fresh. Some users have complaints about the start button quality. 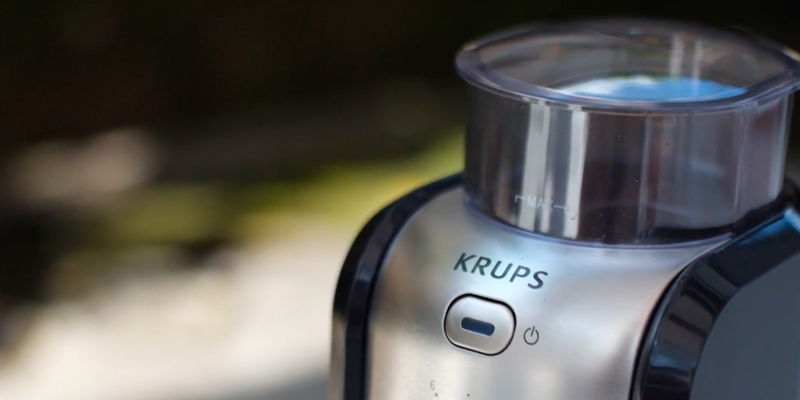 Featuring a fineness selector with as many as 17 positions, the KRUPS GVX231 allows you to experiment with grind fineness and adjust coffee strength to your taste. 4 rubber feet at the bottom ensure steadiness on any surface and a built-in safety fuse makes this device safe in use. It may be a bit difficult to clean the grinding chamber if you've milled some species. 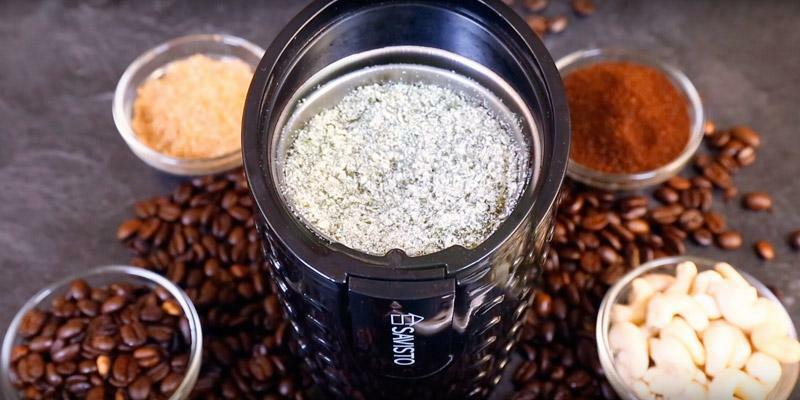 A robust and utility coffee grinder at an affordable price will come in handy for true coffee lovers and those who require a device for other ingredients powdering. Stainless steel construction guarantees long service life of the device. The coffee grinder is approved by CE and ROHS. The least powerful device on our shortlist. Perfect appliance for coffee, nuts, species, and herbs grinding in less than a minute to complete all the cooking and baking needs. The push button located on the housing for a handy operation ensures accurate control over grind texture. If you mill some solid nuts or species, the rotation speed of a blade might vary. Stylish stainless steel housing of the coffee grinder will decorate any kitchen. 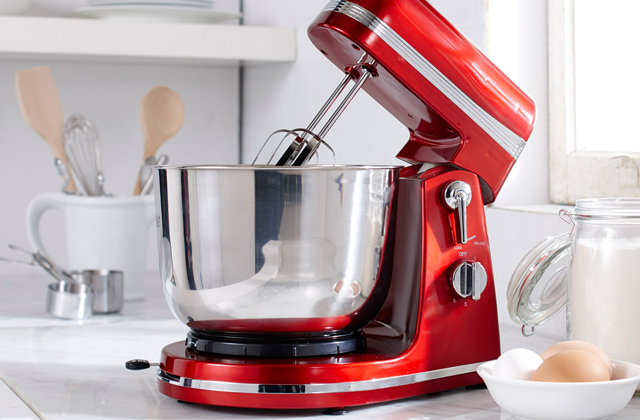 Using this appliance, you can even turn sugar into powdered sugar for your pastry. 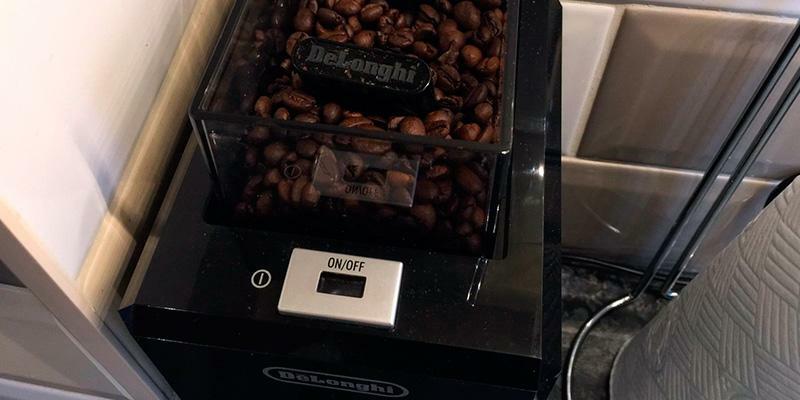 DeLonghi KG79 is a burr coffee grinder. Owing to 2 built-in grinding wheels, the coffee beans are ground without overheating. Such technology is meant to preserve coffee aroma and natural oils. For this very reason, the burr coffee mills are valued among true coffee lovers. 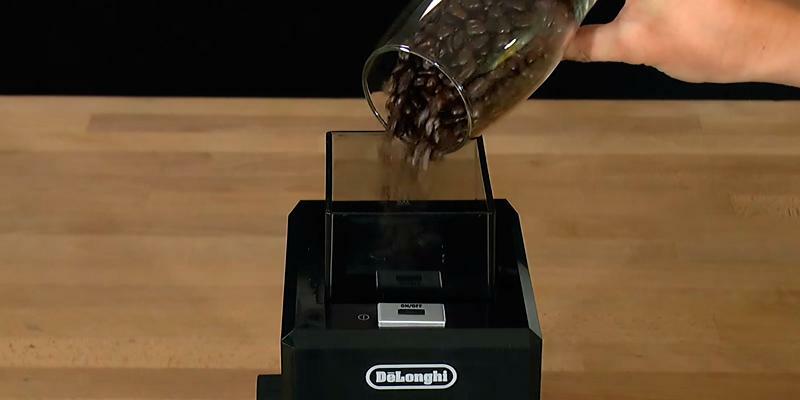 DeLonghi KG79 burr mill allows you to set desired ground coffee setting for different drinks. However, the price range for burr type appliances slightly differs from that for blade type coffee grinders. DeLonghi KG79 Professional Burr Grinder has the power of 110 Watts. Maybe it is not the most powerful coffee grinder in the world, nevertheless, it is capable of grinding coffee to the consistent texture to meet all the requirements of true coffee lovers. With the ability to grind 120 g of coffee beans at a time, DeLonghi KG79 produces up to 12 coffee cups in several minutes! It is worth mentioning that this model is the most capacious one on our shortlist. This burr grinder is designed not only to perfectly grind coffee beans but also to decorate and accentuate individuality of any kitchen's interior. 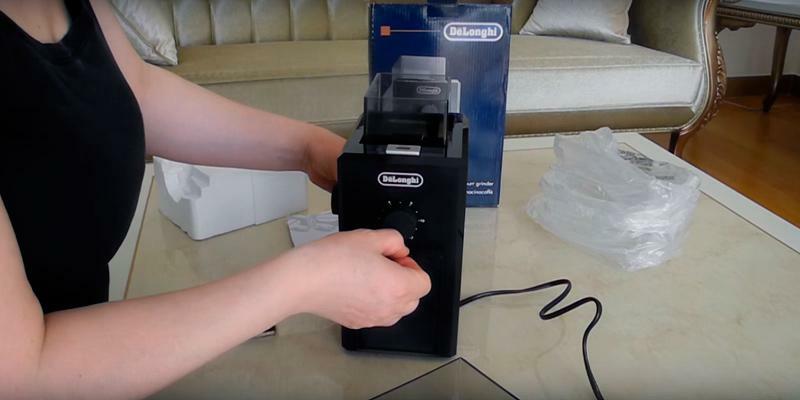 DeLonghi KG79 is made of durable plastic and offers a transparent removable chamber. You can store enough pre-ground coffee in it for making several cups of your favourite drink. Pretty convenient, isn't it? 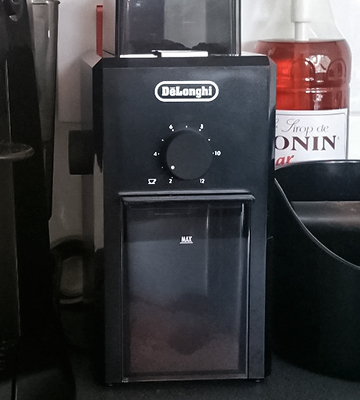 DeLonghi coffee grinder has average dimensions, thus you can place it on a countertop and it won't take much space. Additionally, this model features a built-in cord storage compartment. Therefore, when the device is not in use, the cord shuts away neatly within the unit, making it easy to store. 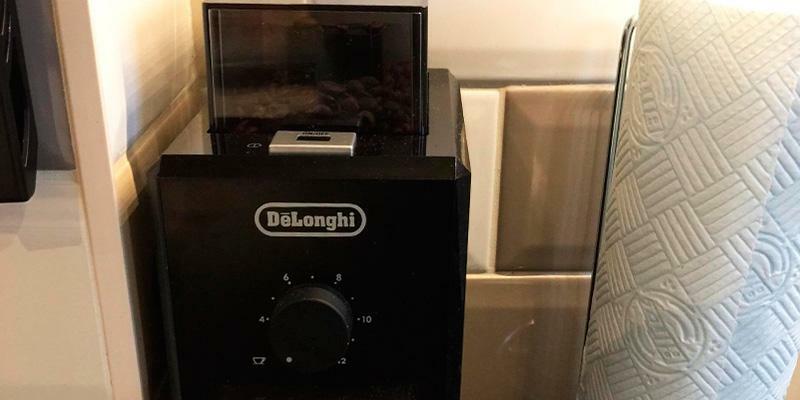 DeLonghi KG79 Professional Burr Grinder comes with a selector that allows choosing between the 3 pre-set finenesses (coarse, medium, fine) to get the exact texture you need. 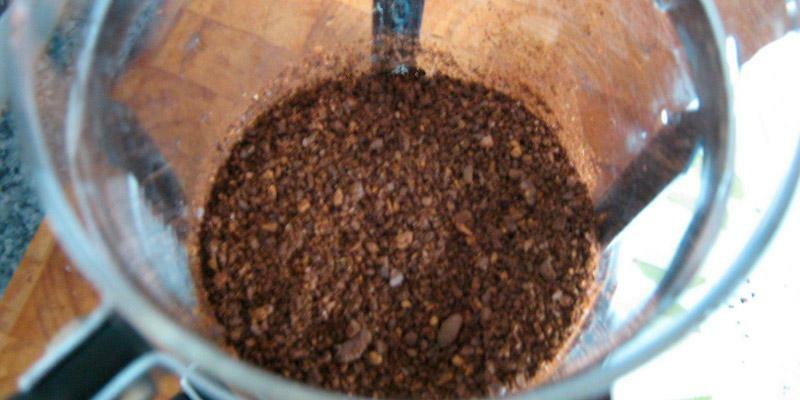 Additionally, you can choose the necessary amount of coffee to be ground from 2 to 12 cups. Also, there's an automatic shut-off of the appliance when grinding is over. 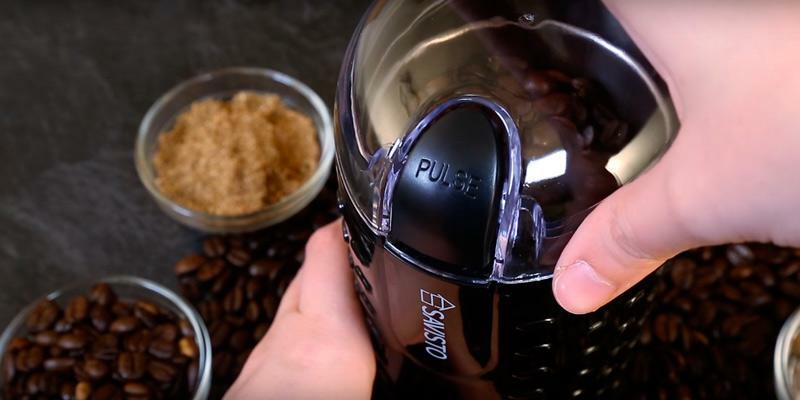 One more advantage of this outstanding device is that it features a dual-safe system that shuts off the grinder if the container for coffee beans or chamber for pre-ground coffee has been removed. To enjoy full aroma and rich taste of coffee, you need the beans ground just before brewing. To relish your cup of coffee to the fullest, you need a machine that will provide uniform grinding, just like the KRUPS GVX231. This wonderful appliance has two burrs to grind your coffee preserving maximum flavour and aroma. 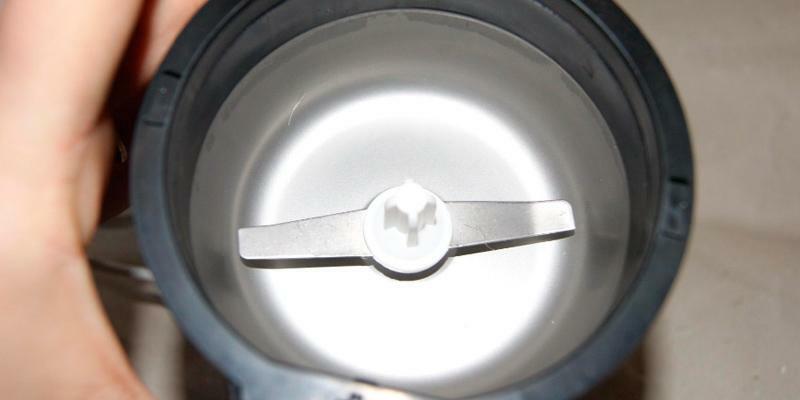 An ergonomic fineness selector allows you to adjust the distance between the burrs to customize coffee strength. You can experiment with a coarser or finer grid (there are 17 settings available) to find the one for brewing your perfect cup of coffee. In addition, you will be able to preset the desired number of cups (from 1 up to 12) to have as many beans ground as you need for making the drink. 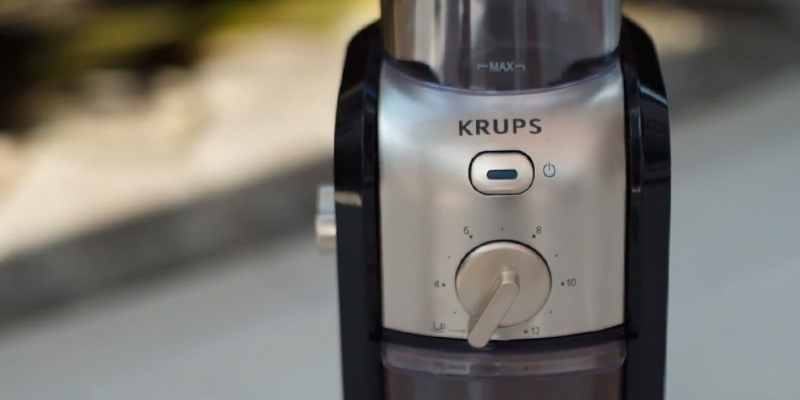 The KRUPS GVX231 combines a stylish appearance and user-friendly design. This black-and-silver unit with a blue LED power indicator on its on/off button will add a touch of elegance to your kitchen. 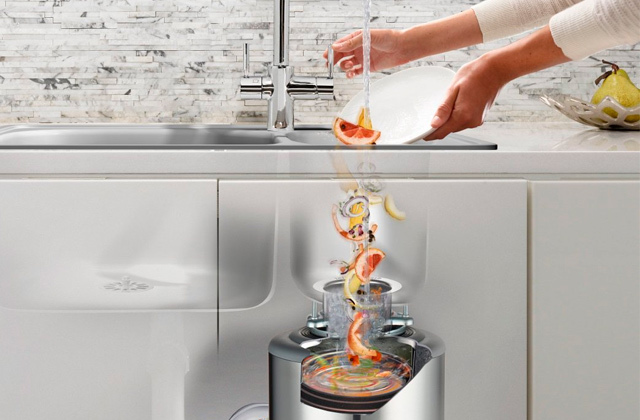 To ensure convenient use, the appliance is equipped with a removable ground coffee container that has a safety lid to prevent any accidental spills. It is important to keep coffee beans protected from any odours or excessive humidity. 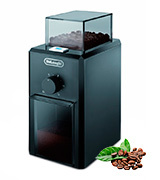 The appliance has a capacious airtight hopper allowing you to keep beans fresh and preserve their wonderful aroma. 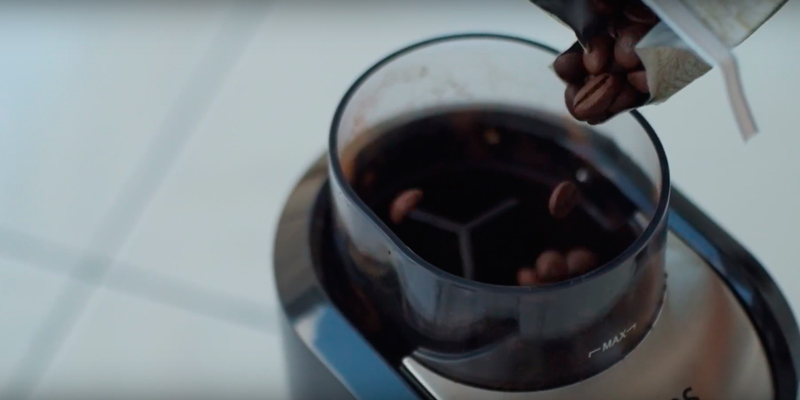 The hopper can hold up to 225g of beans depending on the coffee type, allowing you to grind enough of it for up to 12 cups. 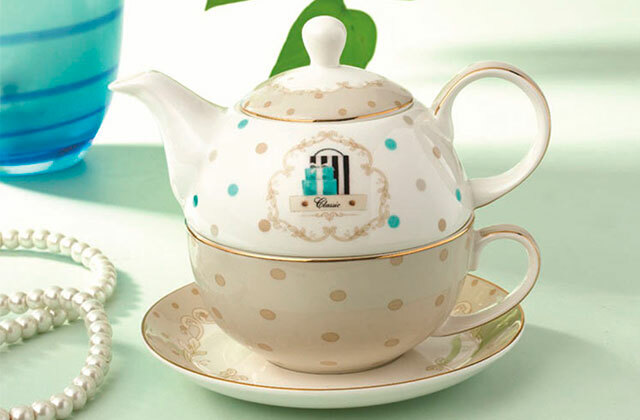 It is a wonderful choice if you are a family of coffee-lovers. Proper humidity level is essential both for your health and for proper storage of your valuables, like fine wines and luxury cigars. We recommend you to look through our shortlist of the best hygrometers to find the device that will help you to monitor your indoor environment. True coffee fans may also be interested in our review on espresso machines. The unit is pretty easy to maintain. The lids and ground coffee holder are recommended to clean in warm soapy water; you can also place them in your dishwasher (upper basket). 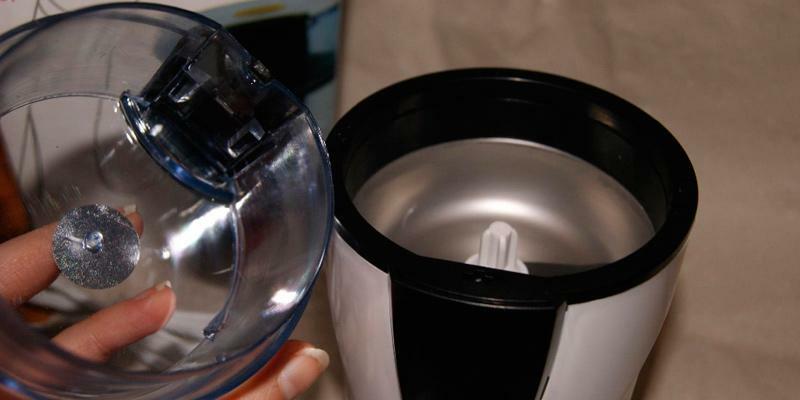 The upper mill can be removed for easy cleaning with a damp cloth. Please, carefully follow the manufacturer's instructions, and the machine will look like new and will serve you for years. This Savisto model is a blade coffee grinder. It has a twin blade at the bottom of a grinding chamber that is capable of grinding beans, nuts, and species. 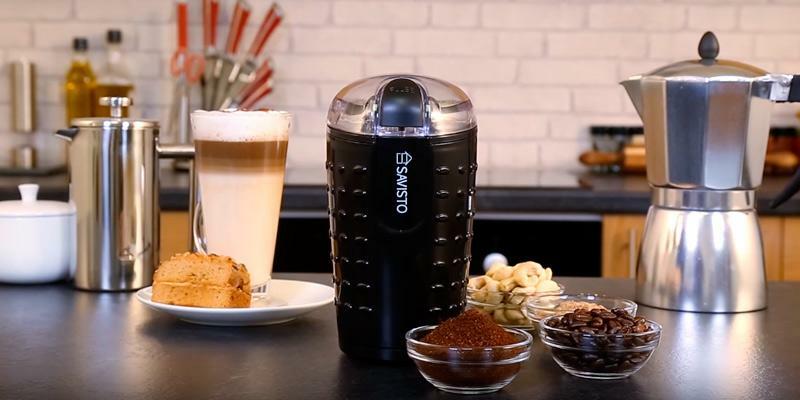 Hence, if you want to make a cup of fresh coffee, prepare some spice mixtures, powder seeds or nuts, Savisto Coffee Bean Grinder is just what you are looking for. Just put the required ingredients into the chamber and press the Pulse button. There are no other buttons to control the device, so it is quite an easy-to-use device. 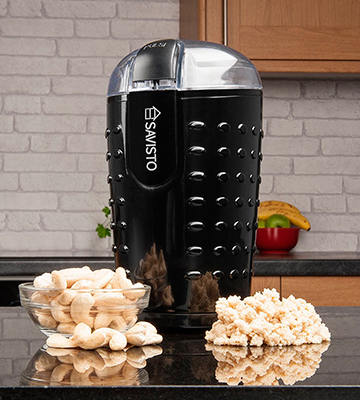 Savisto Bean, Spice and Nut grinder is equipped with a 150-Watt motor that guarantees a pretty fast grinding. The grinding chamber holds up to 70 g of coffee that is enough to brew about 10 cups of the flavourous drink. Thus, Savisto Coffee Bean Grinder is a perfect appliance for a small family. As you may know, brewing coffee in a jezve requires the finest grind and this very model allows you to turn coffee beans literally into the powder. Four rubber feet provide steadiness whereas a textured plastic housing prevents slipping during use. Moreover, the body material is very pleasant to the touch. 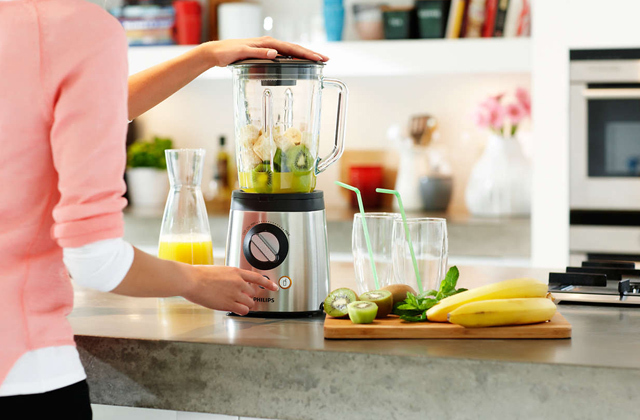 Owing to a transparent lid, you will be able to watch the grinder in motion and control the grind fineness. Thus, when the beans are ground sufficiently, just release the Pulse button and get to brewing a cup of delicious coffee. 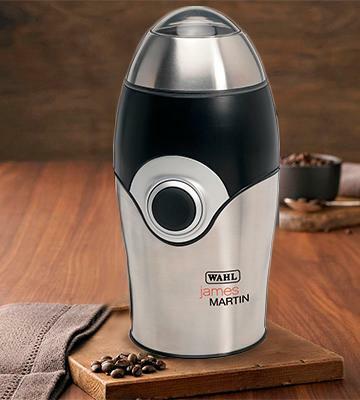 The coffee grinder will definitely serve you for a long time as it is designed with the stainless steel blades that guarantee long-lasting sharpness. 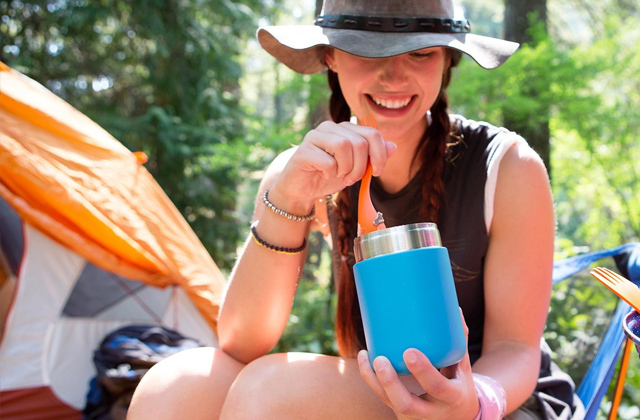 The coffee grinder is designed with the safety in mind. It won't start grinding until the lid is fixed properly, thus the risk of injuries is brought to nought. So, the manufacturer has designed this coffee mill as a robust and safe to use appliance. 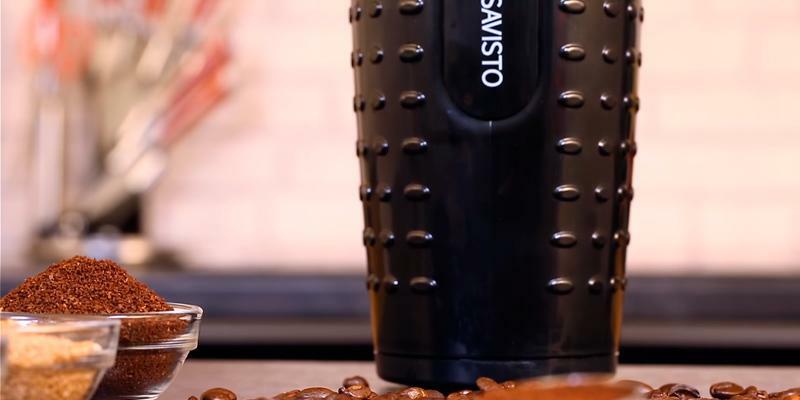 It should be noted that Savisto Coffee Grinder is not dishwasher safe, but its cleanup is as easy as a pie. Enjoy your coffee brewed from freshly ground beans on a daily basis! 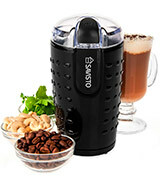 Chef's Inspirations is a blade coffee grinder that can help you grind not only coffee beans but also nuts and different kinds of spices efficiently. Here, the degree of fineness depends on the grinding time. Whether you prefer fine or coarse grind, with this device, you'll definitely achieve the optimal grind texture to come to your liking. Additionally, a push button operation makes the grinding process a piece of cake. 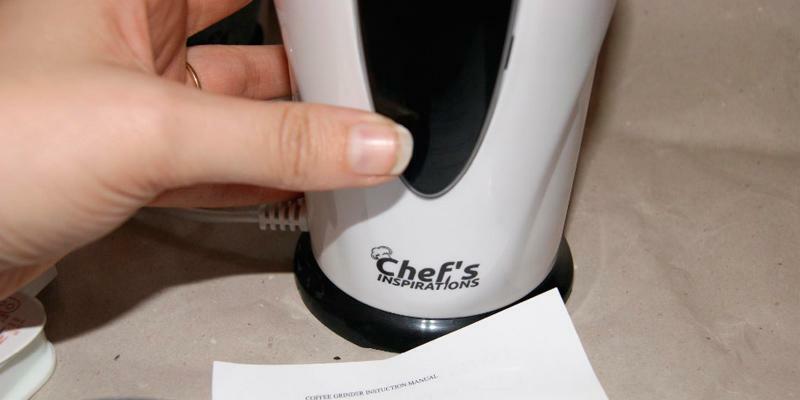 Chef's Inspirations coffee grinder has an overall power of 100 Watts and holds up to 70 g of coffee. Maybe, it is not the most powerful and capacious model on our shortlist but taking into account its low price, it is pretty robust and reliable. This model ensures high-quality grind and the amount of ground coffee at a time is enough for brewing 10 cups of coffee. 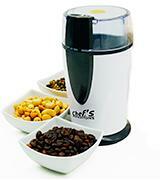 On buying Chef's Inspirations coffee grinder, you will get a true bang for your buck! Unlike other coffee grinders in our review, all parts of Chef's Inspirations grinder including blades, chamber and body are made of stainless steel. 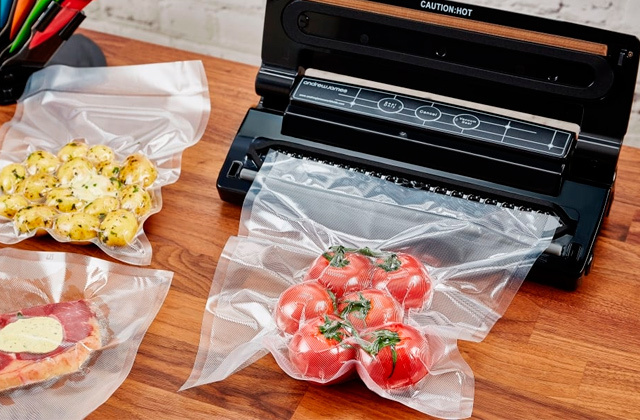 Such peculiar design ensures durability and reliability of the device for long years of use. 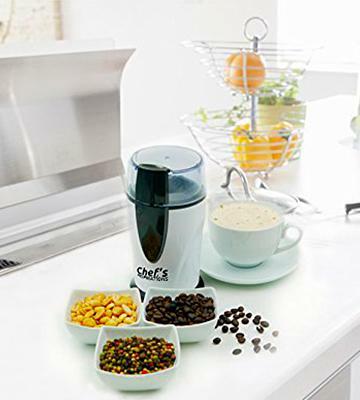 Chef's Inspirations coffee grinder is not only useful but also very much attractive to the eye; it will surely become a nice and helpful assistant in any kitchen. 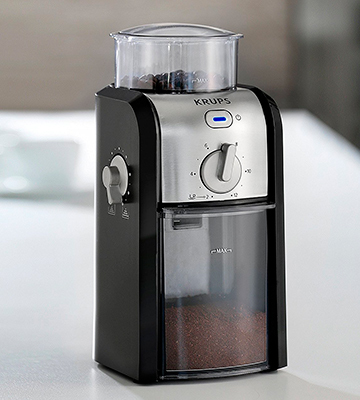 Chef's Inspirations coffee grinder boasts simple controls. All in all, there is only one push button that turns the appliance on and off. For your safety and especially for the safety of your children, no one will be able to grind coffee unless a lid is properly attached. 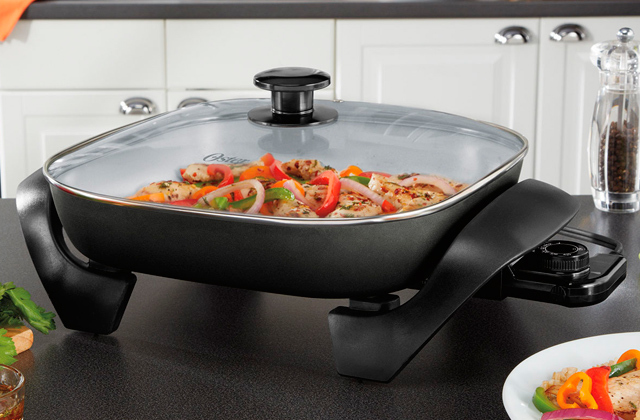 The appliance is fairly easy in maintenance since it is dishwasher safe. And of course, all the removable parts can be cleaned under the tap water. It is a common knowledge that the secret of a delicious cup of coffee lies in the right coffee beans sort, roasting grade, and a brewing method. But it is only part of the story since each coffee beverage requires an appropriate grinding. 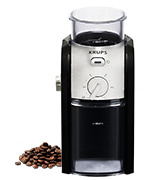 With this fantastic blade coffee grinder, you can control the grind texture for a perfect drink. And a single button will make the grinding process an engrossing morning ritual for all true coffee lovers. This blade grinder is pretty powerful - its electric motor yields 150 Watts. It takes minutes to grind enough beans for 12 cups if you fill the grinder to a full capacity. However, if you don't need so much ground coffee at a time, you can load the exact quantity of beans. 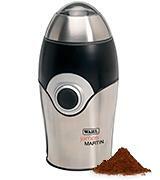 You can also use James Martin ZX595 Mini Grinder for herbs, nuts and spices milling. The coffee grinder will come in handy for performing most cooking tasks. The appliance's housing and blades are made of stainless steel. This feature emphasizes not only the device's durability but also prevents the chamber from absorbing foreign odours during grinding. Therefore, your coffee will never have a savour of previously milled herbs. For your convenience, there is a transparent viewing window. Hence, you can control the grinding and stop the device when the beans are ground to the optimal fineness. Pretty convenient! When the coffee grinder is not in use, you can easily store it in a cupboard or just place it on a countertop. This model features a special power cord storage compartment at its bottom so that you can arrange all little things there and save your working surface from unneeded mess. A safety "lock in" lid doesn't let the grinder start running until it's been fixed properly in place. This feature makes it pretty safe to use even for kids. (Though, children shouldn't drink coffee until they reach at least 15). 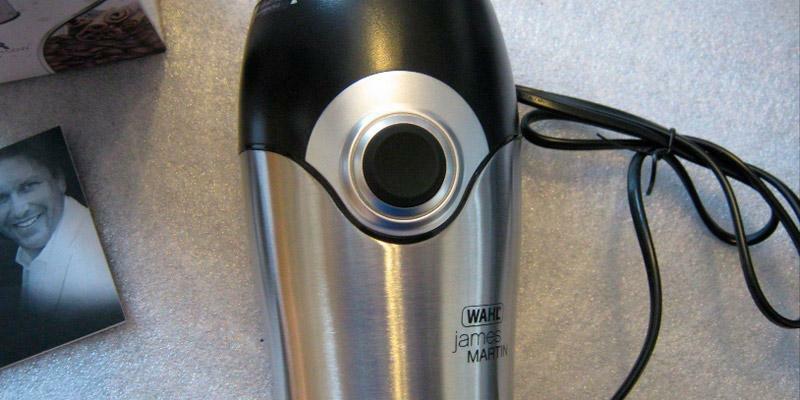 James Martin coffee grinder doesn't need a lot of advertising since it's already well known from TV shows where James Martin uses it every day! Some people like brewing coffee in the Turk while others prefer using coffee brewers or espresso machines. But everybody knows that, first of all, you need well-ground coffee. Nowadays, there are two kinds of coffee grinders: manual and electric grinders. But electric grinders are surely leaders! Don't forget that the procedure of grinding the beans with the help of manual grinders can take about 20 minutes! And it requires a lot of effort! 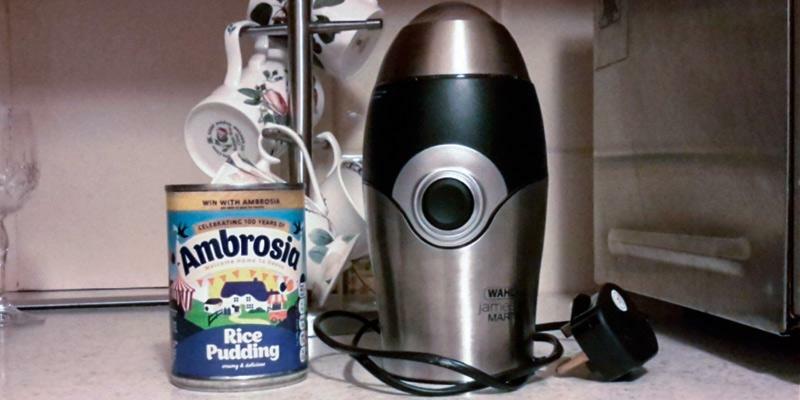 Electric coffee grinders can do it within a couple of minutes. 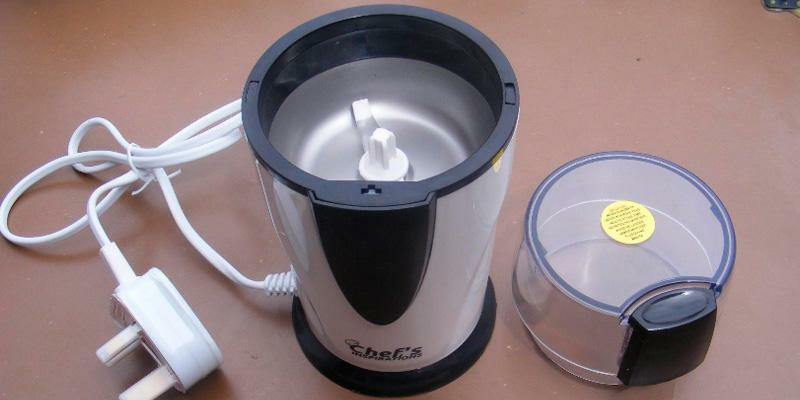 Electric coffee grinders can be divided into 2 major types: blade and burr grinders. Therefore, before choosing a coffee grinder, consider all pros and cons to make the right decision. 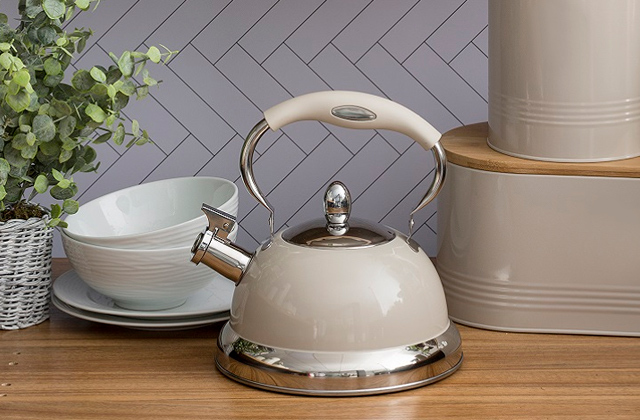 Once you've ground coffee beans, you can either brew coffee in a special pot or use one of the coffee machines available on our shortlist. 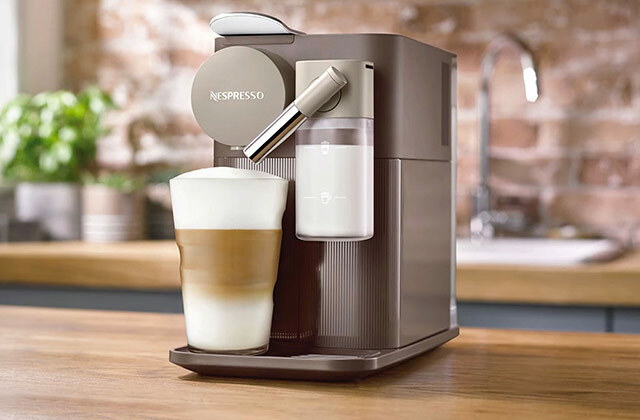 If you are a real lover of coffee, you surely adore all kinds of this fragrant drink, including latte, macchiato, cappuccino and that's why you need to use a milk frother. When choosing the grinder, you need to decide what Grinder Type you need. As we have previously mentioned, there are 2 types of coffee grinders: blade and burr grinders. As for the blade grinders - coffee beans are ground with the help of sharp knives, which are rotating at a high speed. Moreover, if you want to make a fine grind, please extend the operation of the grinder. In addition, blade grinders are cheap, easy to use and provide high-grade grinding of coffee beans. But be careful when using it - a sharp knife is easily accessible so that a potential risk of injury can be possible. A burr type is made especially for gourmets. Burr coffee grinders use two revolving abrasive surfaces to ensure uniform grinding of the beans. 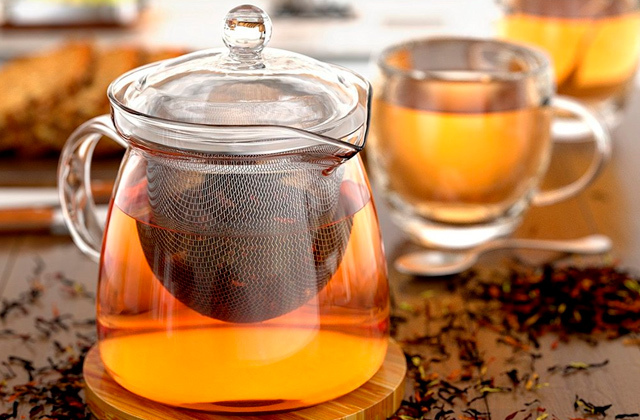 In addition, they produce less friction and less heat which helps to preserve your coffee aroma. Power and Capacity of the coffee grinder are valuable features. Power affects quality and speed of grinding. 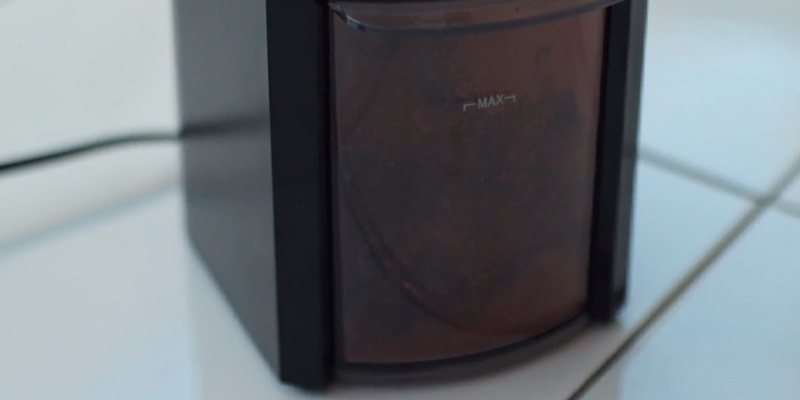 Also, a low-power coffee grinder will be grinding a lot of beans for too long. So, pay attention to your chosen coffee grinder capacity and compare it with its power. The mid-power grinders yield from 80 to 270 Watts. Of course, don't forget that burr grinders may have less power but produce more coffee thanks to a great design. In addition, you have to be aware that very high-power grinders aren't always good because the fast grinding of beans can add some bitter taste to a drink. The Design of a coffee grinder must ensure that an appliance is comfortable and easy-to-use. If you like small coffee grinders, you surely need to take a closer look to the blade grinders. In general, they are smaller than burr grinders. The burr type of coffee grinders is usually equipped with larger motors than blade ones. Also, the blade grinder has only one container for coffee beans while the burr one is equipped with containers for coffee beans and ground coffee. Also, grinders can be made from metal or plastic. Surely, metal grinders will serve you longer than the plastic ones. But in case of proper use, each of them may work properly. 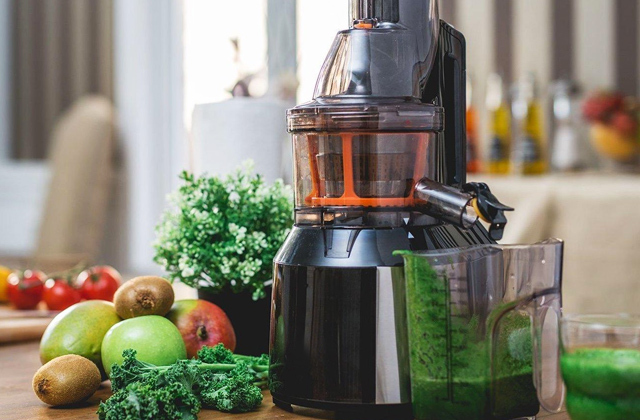 You should decide what design of a grinder will satisfy your requests and, of course, fit your kitchen decor. Some coffee grinders have Additional Options. The most important feature is the control of grinding coarseness (from coarse to fine) that allows you to select what coffee you will drink today. 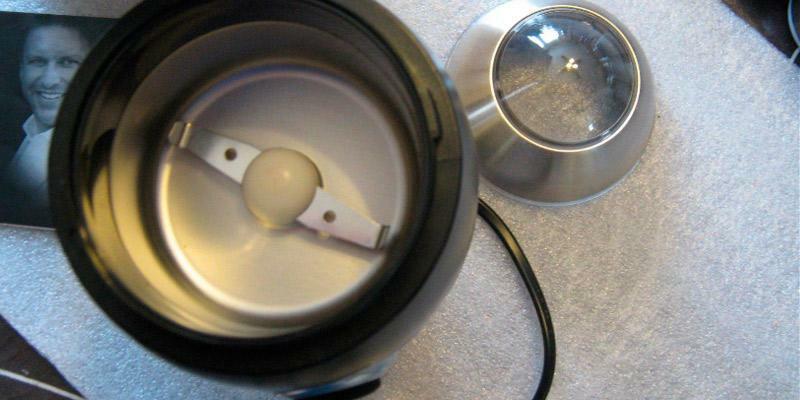 In addition, the dosing option will be useful, so you can grind coffee beans only for 1 cup. This is a great option because all coffee addicts know that real coffee loses its taste in 60 minutes after grinding. In addition, some models are equipped with twin blades, which greatly increases grinding speed. We can also point such great features as a built-in timer and hidden cord storage.